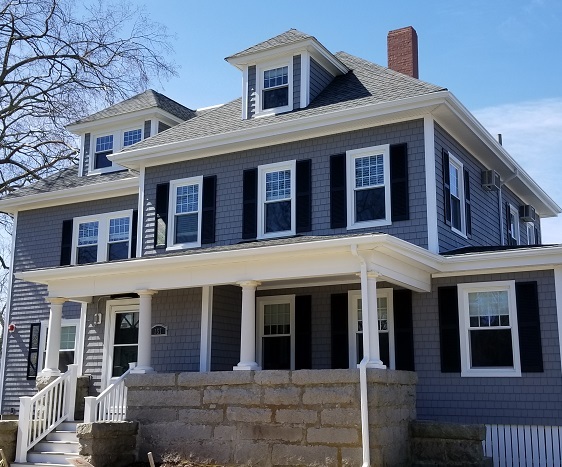 This New Bedford, MA office building got an expansive face-lift with AZEK porches, Cedar Discovery vinyl siding, aluminum trim, gutters, shutters and two Thermatru entry doors! We’ve done work for SouthCoast Hospital Group in the past and we were happy to work with them again! Check out the previous project here! AZEK decking was used to build and refurbish the front porch and back deck. They chose AZEK’s Harvest Collection’s color, Slate Gray. Our customer’s favorite decking, AZEK resists mold, mildew, moisture, insects, stains, scratches, and splitting. With exceptional professional product warranties to back their beautifully engineered products, AZEK provides homeowners with the peace of mind to truly unwind and enjoy their outdoor living space. The old wood siding was peeling and ready for replacement. 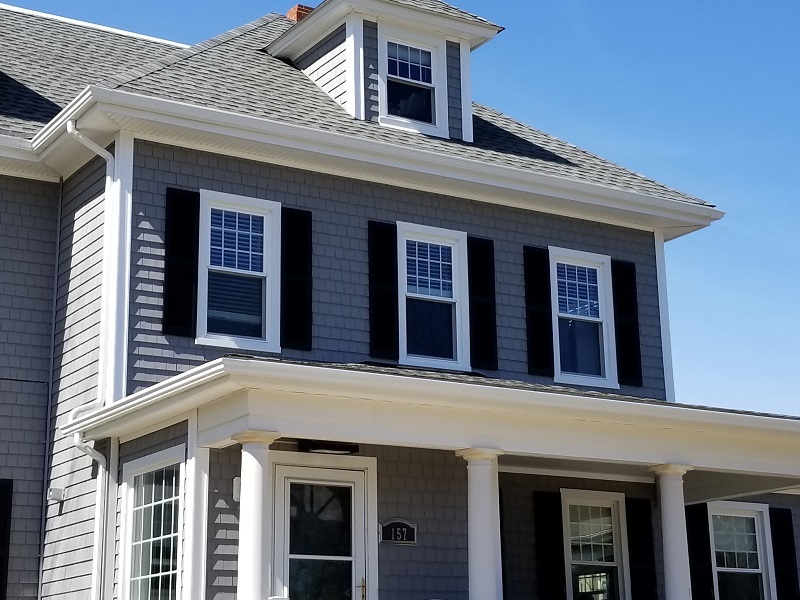 They selected Mastic Cedar Discovery vinyl siding in the color Deep Granite to get the wood-look style without the maintenance! 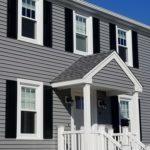 Our custom trim installation truly sets our vinyl siding projects apart from any pickup truck contractor. Mastic aluminum coil in white was fabricated around the windows, doors, and fascia boards. 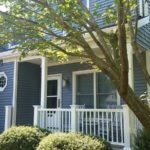 As a Mastic Elite Contractor and Certified Installer of the Vinyl Siding Institute, our expert siding installers use a portable break system to cut, bend, and shape every piece of trim. Our customers enjoy the realistic look of wood without the need to paint every 3-4 years! Harvey shutters and two Therma-Tru entry doors completed the exterior transformation. When it’s time to move forward with your home improvement project – give Care Free Homes a call at (508) 997-1111. We’ll set up an appointment for a no cost, no obligation estimate. 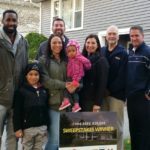 With over 40 years of experience and thousands of satisfied homeowners throughout Cape Cod, Southeastern Massachusetts, and Rhode Island – we are proud to have past customers be our number one source of business! Get a FREE quote and make your house a Care Free home!